Something that the rest of the country may not know about the Pacific Northwest is just how abundant Thai food is here. I am not sure why, but the population here has embraced the flavors of southeast Asia with gusto. Even in my medium sized city, I can choose from about 12 different Thai restaurants that are within 10 miles of my house…and I don’t live in town. With so many options to choose from, the quality of food that these establishments kick out is usually pretty good since competition is a bit stiff. 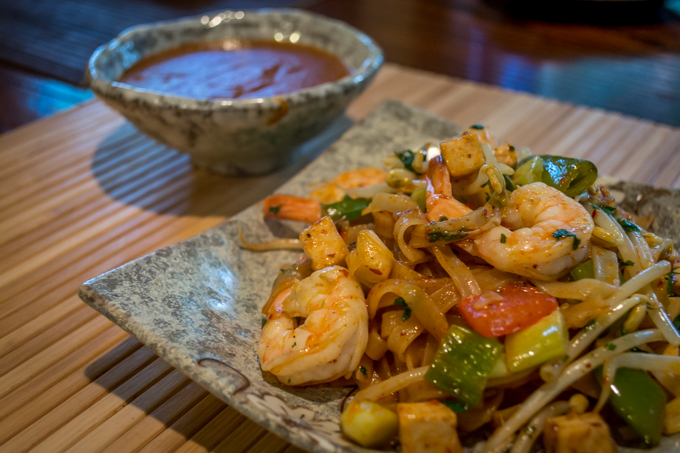 One item that is always on the menu is some variant of Pad Thai. I am really not clear why people here developed such a fever for Thai food; maybe it’s the dismal weather. I do have a vague recollection of Thai food becoming common place some time in the late 1980’s. I do know that pad thai was a staple food for me in college, as it was very cheap and highly available in Seattle. And honestly, there is a lot to love about pad thai. The fried rice noodles are satisfying, filling, and have a delightful sweet and sour flavor. The chili and fish sauce accent both the sauce in which the noodles are cooked and the stir-fried ingredients in the dish. And what a great variety of ingredients there are; you typically get your choice of meat (shrimp, chicken, pork, beef) to go with the array of vegetables and tofu that the cook selected. Sunday’s lunch was a big pile of Sichuan-style food. Yay! This main dish is what we cooked to accompany the Dan Dan Noodle, that I mentioned earlier. 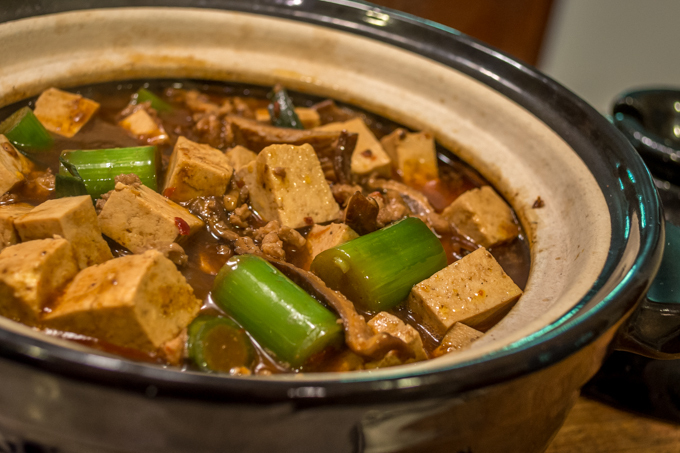 Mapo tofu is pretty much a classic. Hot bean paste is cooked together with ground pork and a grip of oil to really develop some spectacularly rich flavors. Tofu and, for my version, leeks and mushrooms are simmered in the infused oil and chicken stock to blend and further develop the flavors. One of the things that I really respect about this tofu dish is that it makes no attempt to be vegetarian. The originator obviously recognized that, if heavily spiced tofu was good, the same tofu cooked in meat sauce would be better. The end result is a dish that is very much comfort food. It is rich, big, and you don’t have to eat a ton of it to fill up….